The shrillness of the tattered old woman’s voice surprises Rebecca, which isn’t easy, considering she’s just endured the greater part of a British siege-- but she doesn’t let on. While still in persona as the Thunderbird-- cloaked in black with a startling white mask, a scraggly, bird-like skull design scrawled across it-- she has to stay calm. Nothing surprises Thunderbird. Musket fire draws Thunderbird’s attention back towards the chaotic flames of the settlement they have just fled. For a moment, there’s a flash in her memory-- a painful familiarity-- before she shakes it off, unrattled. Nothing rattles Thunderbird. Thunderbird considers-- until she’s alerted from behind by approaching gallops. She flinches, a moment, though so slightly most wouldn’t notice, until she confirms its friends-- Dispatch and Banshee-- or Frederick and James-- her two lead generals and her comrades at arms in the motley collection of war orphans who’ve banded together in a crusade to help patriots on the Western Frontier, known to those they help as the Cuyahoga River Riders. “The militia men are fleeing,” breathes Dispatch, his booming voice matching the pure blacks of his costume and severe mask. “Is her family with the survivors?” Dispatch asks. “This babe belongs with family!” again echoes from the lady’s desperate voice. “I’ll take her,” says Thunderbird plainly. “That’s through Shawnee territory,” warns Banshee. “You’re not going?” asks Banshee, but it’s more a statement. The babe, startled from her abrupt transaction, begins to wail. Thunderbird eyes her. She pulls back her glove, feels the crown of the infant’s head. “This babe is warm. Is she ill?” But the woman is gone-- fleeing to join the other survivors. Dispatch and Banshee share a glance with each other, then to Thunderbird, who simply looks back and considers the wailing babe. About a half mile away and half an hour later, three riders reconvene before heading their separate ways. In the distance, the fires and smoke and rubble of the small settlement-- another casualty of this war for independence-- terrorize an otherwise calm night. Again, memories crawl through Thunderbird’s thoughts as she dulls them with chores, tending to securing the struggling and still wailing babe to the back of her saddle. Thunderbird-- Rebecca-- is no nursemaid, and has little idea (or concern) for how to cool the babe’s temperament. “Sounds like you’ll have a fun week, love,” teases Banshee-- now James, with his mask removed, revealing aristocratic good looks. “I’m open to other ideas,” Rebecca scolds, getting none in return. Without her mask, her dirty red hair frames her high cheeks and attractive features nicely, but she still carries a stern and cold demeanor that commands effortlessly. Rebecca’s response is a blank stare. James dashes scolded eyes at Frederick, who smirks with a raised brow. They put back on their masks. “We’ll head east-- hopefully draw any sentries our way,” Frederick, now Dispatch with his mask returned, suggests. Banshee and Dispatch nod and ride off. Rebecca looks back at the babe, still crying between broken intermittent pauses. She takes a deep breath, and returns her own mask, again becoming Thunderbird, and ready to return to her war. She darts through twilight quick and effortless. She was born to ride. She hopes heading wide southwest she can maneuver around the British invasion force that’s now split into disparate groups in pursuit of the retreating militia. But she’s wrong. As she enters the first clearing, three sentries, maybe fifty feet away, wait at guard. The wailing child and the full speed gallop give her up instantly. Musket fire explodes. For an instant she fears only for the babe. Then, only for the mare. She feels no fear for herself-- until the bullet cracks into the back of her right shoulder, dropping her arm limp. She screams, but grinds her jaw to muffle it. Thunderbird doesn’t feel pain either. She doesn’t slow a beat, but half angles back from her fleeing horse and with her good arm takes out her own loaded pistol, aims, and fires-- knocking one of the sentries from his horse, and sending him colliding with the two others. It’s a good shot-- she’s a good shot-- and it’ll buy her the time she needs. Though the horse seems unharmed, the babe wails louder and louder. It’s impossible to know without stopping if the child is simply startled again or has been hit herself. But with few precious extra steps, Thunderbird can’t stop now. About three hours later, she finally feels safe enough to camp. After preparing a fire-- which proves challenging, with only one working arm-- Rebecca tends to the babe. 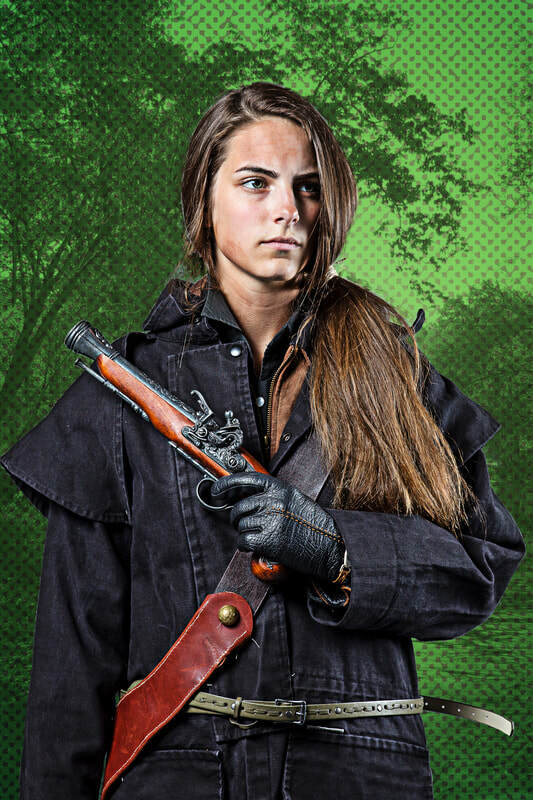 The child is indeed unharmed, at least from the musket fire-- though to the touch she feels even warmer now than before. Rebecca can offer little help for that besides sleep. Satisfied, she turns to her wound. The bullet’s embedded in her right shoulder, and though it’s left only an entry wound, she’s still lost plenty of blood, which has soaked through her undergarments, clothes and outer cloak. She’s already feeling lightheaded effects. After cleaning the wound in the nearby creek-- hoping to prevent gangrene-- she rips shreds from what unstained clothing she has left, and fashions a bandage across and around the wound. She then loops a brown scarf around the bicep of her right arm, and twists the slack taught with a nearby stick, fastening a crude tourniquet to slow the loss of blood. With the last of it, she fashions a sling for her right arm, mostly pinning it immobile. It’ll do for now-- but she’s not sure it’ll keep her through to Richmond. The next day is a hard yet eventless ride, but by night’s camp, Thunderbird is less concerned about making Richmond in time, and more about making Richmond at all. The babe has quieted, and her fever seems increasingly worse; and still losing blood, Rebecca’s dizzying spells are stronger and more frequent. She’s dehydrated, and her skin has paled, and as her shock wears off, she can feel her arm again, but it’s mostly an intense pain. She has cold sweats, aching muscles, and short breaths. By her calculations she’s still, best case, almost four full days from Richmond. She’d have to ride hard to keep that pace, if she even had that much time. There are options she can turn to for help, of course-- forts and settlements sympathetic to the River Riders, with medical resources, food and shelter. She needs to rest-- not ride-- and it’s likely the babe needs the same. But any deviation from her present course-- a straight shot through Virginia’s contested frontier into the heart of the raging war-- and the child’s uncle would be gone. What would she do with her then? And did this child not deserve to be with her family? Family. What does that even mean to Rebecca anyway? Are the River Riders her family now? The only real constant in her life, it seems, is Thunderbird’s war. The second day is when she sees it. It’s above her-- a vulture, she thinks, at first, maybe-- attracted to her stench, or the feverish smell of the child-- death does seem near. But a longer look decidedly reveals it’s not-- it’s a bird of prey-- a hawk. It looks like a nightmare, with a wide, towering wingspan closer to that of an eagle’s than of any breed of hawk she’s seen before. It’s dark and silent-- but follows true. For the rest of the day’s ride, it stalks them. For the first hour, Thunderbird thinks little of it-- hawks aren’t generally dangerous to humans. But its persistence becomes unnerving. There’s something about them that has this raptor fixated. Day three, the visions start. At first, their just shadows in the corners of her eyes, but soon they warp into full fledged, overwhelming illusions-- of redcoats, firing down on her-- phantoms from childhood trauma-- or fires raging in the forest all around. Loss of blood and fatigue are taking its toll. It’s possible, she thinks, that the pursuing bird is also an illusion, a harbinger of the others. But as she attempts to cut from the forest to a much welcome open road-- one that would assure an on-time and decidedly easier ride to Richmond-- the bird dives and attacks. Thunderbird reacts quick enough, the raptor missing them entirely. It glides to a nearby limb and watches its prey. The babe. 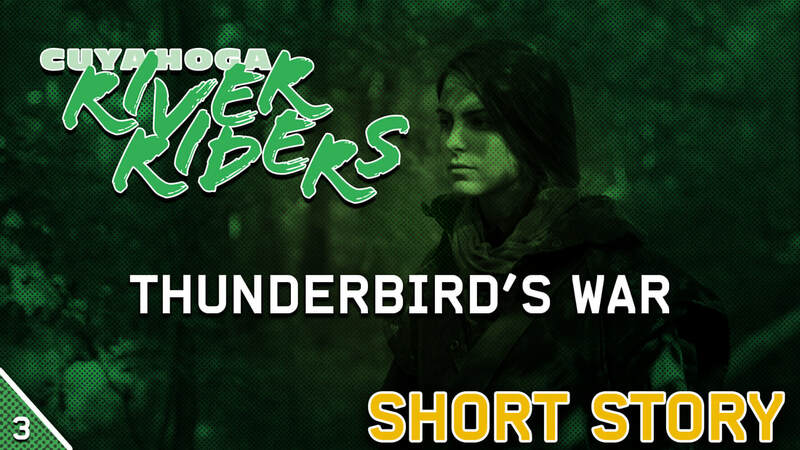 Thunderbird readies her pistol and with her good arm aims and fires-- but completely misses. The bird doesn’t even flinch. It’s the clear, openness of the road, she realizes, that incentivized the attack. The road would save her considerable time and energy-- both of which she has very little of-- but in her current state she can’t protect the child from a mad animal. She returns to the forest, where the coverage there seems, for now, to keep the bird at bay. She makes bad time the rest of the day. The forest is merciless, the visions are overwhelming. She blacks out twice. And the babe, still on fire, makes no sound, and shows few signs of consciousness. And all the while, that hawk keeps its vigil. Exhausted, Rebecca camps early, before dusk. They’re both dying, and she knows it. If she can make the road, she can still make it to Richmond just in time. The ease of the ride might also be enough to keep her alive until they got there. But, with the babe, that isn’t possible. But she can not continue like this. As she bathes the child in a nearby stream, she confirms a pulse, and limited consciousness. Though the babe is alive, is she too far gone? Rebecca wipes the child’s brow with the cold water and considers her options. She eyes up-- and even in the dusking night, she can spot that the hawk watches from above. She holds up in a cave that night and sleeps with the swaddled child in her lap, the pistol ready in her hand. Her dreams that night are feverish, and especially incoherent, even for dreams. But one clings to her as she wakes. Images of a forest, carved down by a two-man saw, men working either side. It becomes clear these two men are familiar-- if men she’d not seen in many years. It’s her father, a former colonial colonel, killed at the Paoli Massacre years before. Sometimes when she closes her eyes she can still see those flames raging. With him-- her brother, Gavin-- a soldier in the Colonial Army with whom she’s not heard from in years. As far as she knows, he is likely dead as well. They cut down tree after tree after tree-- leaving a forest of stumps; which is suddenly consumed by wildfire. She doesn’t remember anything after that. She wakes with thoughts and feelings of her father, whom she’d lost to a British bullet-- the tragedy that had made her an orphan, and led her to this life, and to her own suffering and seemingly certain death by a British hand. Her arm feels worse, phasing constantly from pain to numbness and back again-- somehow feeling more painful and more numb each phase. The babe no longer responds to food or water, and her fever is somehow even worse. And of course, a shrieking call above. The hawk remains. Rebecca stumbles to collect the child and her strewn about things. She stops as she looks over the babe’s miserable suffering form. This barely born, almost dead thing is an orphan now. That’s a hard life. Rebecca knows that first hand. But still-- doesn’t she deserve to be with her family? But Rebecca isn’t with her family. And she never would be again. Her mother and father dead-- and her brother lost to the war. Who knows if she would-- if she even could-- see him again. And the Riders aren’t family. She’s not really Thunderbird-- that’s just something she needs to survive the war. Something she can get lost in. If anything, the war is the closest thing to family she still has. The Riders do serve a purpose, but after the war is over, what’s left for them? Can any of them really have normal lives? When war is your family, where do you go in peace? For a moment, she considers what, only a few days before, would’ve been unthinkable. The bird wants the child. If she left it the child and saved herself she could make the road easy-- no one would ever know. She’d survive to fight another day. And she’d spare the world the burden of one more war orphan. The hawk’s mad shriek calls from the outside sky, as if demanding for Rebecca to decide. And she knows what she has to do. The hawk watches, from branches above the cave, as Thunderbird delicately places a swaddled wrap of blankets on the ground. She looks up, as if to concede her surrender, and to bless the offering, before mounting and riding mad away. The hawk watches a moment. It spreads its wings. It shrieks. It grabs at the swaddled form with ferocious claws and digs hard into its prey as it starts to glide off-- but upon catching the fabric of the babe’s wrappings, it can’t seem to dig deeper. It can’t grab flesh. The raptor attempts to soar back to the trees, but the collection of rocks which mocked out the form of the babe-- what deceived the bird-- weighs it down. Only for a moment. But it’s enough. The pistol rings out, blasting through the bird, killing it instantly. Thunderbird steps up from her crouch by the nearside of the cave, where she’d jumped her horse and doubled back to wait for a close enough shot that even, mostly dead, she couldn’t miss. She was a good shot, after all. She returns to the cave. She removes her mask-- again Rebecca-- and wraps it tightly around the naked babe. She caresses its smooth head. This child did deserve to be with her family. And she was about to be. They’re in Richmond before the next day’s dawn. She finds the child’s uncle, and the babe’s no longer an orphan. Rebecca stays in the hospital for a little over two weeks, en route to a full recovery. Though the babe had left with her uncle some days ago, word from the nurses was she, too, would survive. Her fever had broken, and she was in full recovery. Her uncle promised, they said, that the child would one day hear about Thunderbird, the warrior that had saved her. And for the next three days, Thunderbird-- Rebecca-- dreams for the end of the war, and being with her brother again. There’s never been a reported case of a hawk hunting a human baby in the real world, but they are known to sometimes attack dogs, cats and other small pets, as they are similar in size to hawk’s natural prey: mice, rats, squirrels and rabbits. There have been some reported cases of hawks and other birds of prey (like eagles) getting into altercations with humans, though these usually only happen in the wild if a human accidentally comes too close to the hawk’s nest. During the American Revolution, travel and communication were significantly slower and more difficult than they are today. Think of how much easier Thunderbird’s journey would have been if she could have gotten on a plane and called the infant’s uncle with her smart phone! If you lived during the Revolution, how would the way you interact with your friends and the world be different, given this lack of communication and transportation technology?